Bubur Cha Cha, a Malaysian dessert consisting of sweet potatoes, taro, plantain, and sago in a sweet fragrant coconut sauce. Serve warm or cold. Bubur Cha Cha is a popular Malaysian dessert consisting of a medley of sweet potatoes, taro, tapioca flour jelly, and sago in a sweet coconut sauce flavored with pandan. Sometimes black eyed peas, plantain, and even durian are added to the mix. This delicious and fragrant dessert is normally eaten in the afternoon or during tea time. Gula Melaka is made from the sap of the coconut palm. The sap is boiled until it thickens and poured into bamboo tubes to solidify. It has a dark brown color and is often used in desserts. Sago pearls are made from the starch of the sago palm. While tapioca pearls are very similar, sago pearls tend to hold their shape better when cooked. These two ingredients combined wonderfully in another very popular dessert known as Sago Gula Melaka which inspired my Ebony n Ivory Dessert. We woke up this morning to a temperature of -20°F (-29°C)! I did not even dare to check the windchill. The high for the day is 0°F (-18°C)…..brrr! On days like these, it is good to have something warm and delicious to chase away the cold and I can think of nothing better than Bubur Cha Cha. My version of this dessert is very simple and can be prepared in minutes. During my vacation to Malaysia last summer, I managed to buy some gula Melaka (palm sugar) and sago pearls. These precious commodities are used only for special dishes or occasions. Please substitute gula Melaka with brown sugar and sago pearls with tapioca pearls if you cannot find them are the grocery store. Soak sago in a small bowl for about 15 minutes. Drain. 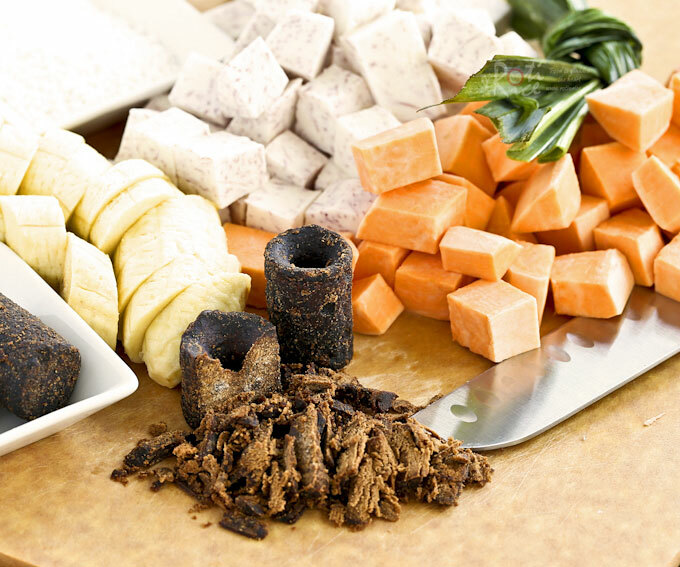 Place sweet potatoes and taro in a steamer and steam for 5 minutes. Combine 2½ cups (600ml) water and knotted pandan leaves in a medium sized pot. Bring water to a boil. Add gula Melaka (or brown sugar). Stir to dissolve gula Melaka. 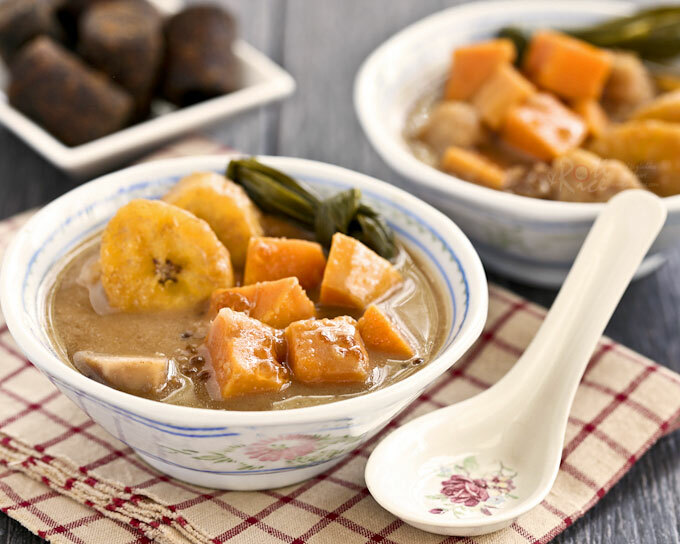 Add sago (or tapioca pearls), steamed sweet potatoes and taro, coconut milk, sliced plantain, and salt. Allow the soup to boil for 3 to 4 minutes. Turn off the stove. NOTE: This post was updated on October 26th, 2015 with new pictures and minor changes to the recipe. 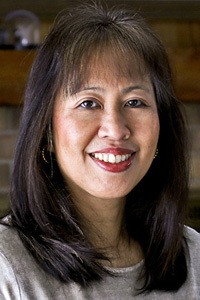 Hi Mary Ann, thanks for visiting! This dish is actually quite nice cold. I keep leftovers in the fridge and eat it cold the next day. Oh Biren, u’ve captured my heart with Bubur Cha Cha. This is one of my fave desserts & eat them often. I like to have lots of sago in mine. We’re spoilt here in S’pore. I’ve stopped making them for a while as it’s easily avail everywhere. Hahaha! It’s so good to be able to walk out and get a bowl of your favorite food. I really miss that. Over here, I have to cook the foods that I miss and crave. I console myself that I can at least get the ingredients. Oh this is such a memory flashback for me! I lived in Singapore for about 6 months and this was my favorite dessert! Some local friends used to take me to this back alley spot that looked straight out of a movie: wooden shack with a porch and lightbulb hanging by a thread. All they served was Bubur Cha Cha at night with a few tables. It was so great and such an unusual dessert for an American. Such great memories! So simple but so delicious, especially with lots of sweet potato, pandan and gula melaka! Hope you’re eating well and staying warm and healthy Biren – diets can wait!! Btw, the bowl your guest made for you is really lovely and so unique. Don’t you love the though that there isn’t another like it in the whole world??! You know you’ve just reminded me that my grandma used to grate gula melaka with her evil looking coconut grater which always made short work of those rock hard tubes of palm sugar! I don’t like dealing with them, so I always ask hubby to buy tons of palm sugar when he visits his hometown in Indonesia – the palm sugar over there is called “gula Jawa” and it’s so soft and gooey (and tastes like creamy butterscotch!) that you can just pinch or pull of chunks of it!!! Thanks Denise, I am touched by your concern. The bowl is lovely and one of its kind. It has little white flecks like the sago – very pretty indeed! It is almost impossible to cut into that tube of gula Melaka but shaving it wasn’t too bad. That gula Jawa must be similar to gula Melaka. So nice not to have to shave it. your house guest sure knows how to make delicious looking bubur cha cha! this sounds absolutely delicious with all those lovely flavors mingling together. and did you say durian? YES PLEASE! most people run the other way at the mention or smell of durian, but not this girl. i think there is actually a Vietnamese dessert quite similar to this because my mom has made something like this. but i don’t think it was Malaysian. i must ask her next time. -20F? That’s like living in Siberia! Thank God for this heartwarming, toewarming bubur cha cha. It’s one of my favorite desserts and the pretty custom-made bowl just accentuates the beauty of the dish. Once in a while we need reminding on how wonderful our local dishes are (we tend to take them for granted when they are available everywhere), and your post has done just that! Biren: I’d luv to taste this…I learn so much from your posts on new ingredients, dishes and flavors. Ok. Now I have cravings for bubur cha cha! Sweet potatoes in dessert? I’m in love! I love drinking bubur cha cha, and so do my family. 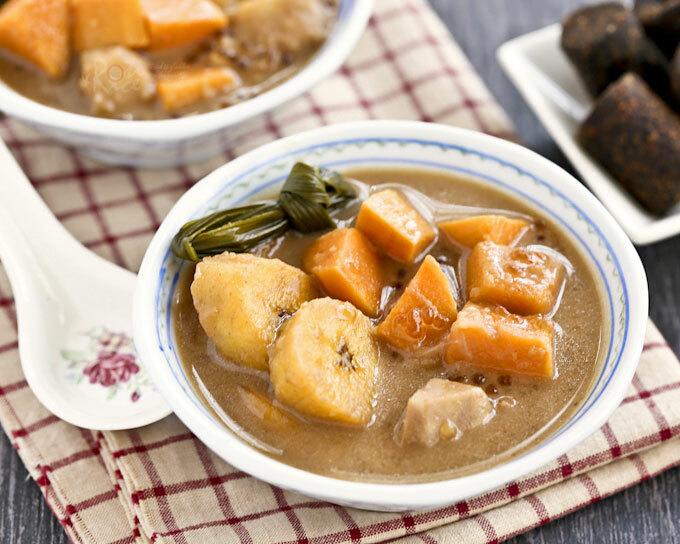 This is quite easy to make but sweet potatoes and taro are not in their season, quite expensive though. This is such a fantastic treat with some substance. I’m a pretty big fan of sweet potatoes, particularly when they are used in interesting ways. Looking forward to making and sampling this recipe! I do believe I actually got some taro in my CSA this past week. Beautiful pictures! It’s amazing to what the raw ingredients can turn into! This exotic dessert looks so inviting. Great recipe, definatly looks like a must try! These flavors , except for the coconut milk and taro, are unfamiliar to me. 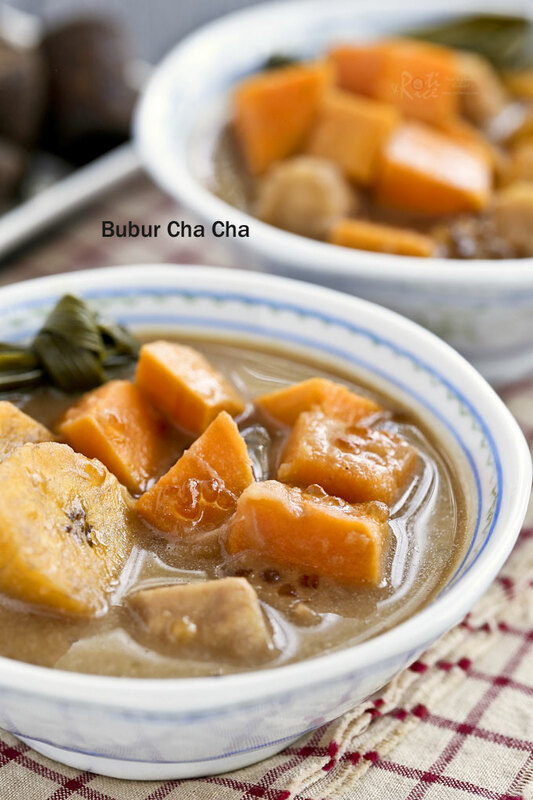 But I’m intrigued by Bubur cha cha (love the name) and wish I could taste it. Hope you’re staying warm and cozy – those temperatures are just unreal! Have not made this for ages, but just eaten this two days ago! Yup, bought this from the ‘chap-fun’ shop! I love eating this with lots of taro. Could you pass over that bowl please? Looks wonderful! Yes, how nice to tuck into a bowl of warm bubur cha cha on a chilly day! This beautiful dessert is completely new to me and I loved reading about it! It sounds so flavorful and healthy…I love the sweet potato in there! What a terrific dish to chase away the cold. I don’t know about you, but I’m ready for some nice weather again! Stay warm! Hi Biren, You have captured the colors and warmth coming from the photograph of your Bubur Cha Cha in the lovely bowl. I love Burbur Cha Cha with extra sweet potatoes. Usually have to pay extra 50cts when you request to add more sweet potatoes. The dessert is beautiful! I have never tasted it. I would have to make it myself, if I am going to try it. I have some pure cane sugar that looks like that but it is in a cone shape, and very difficult to cut. I feel bad that you are so cold…and here I’m Whining that we only made it to 58°F so far today, but the sun is out so it feels warmer in the sun. Man is that cold!! I’m glad you had this warm treat to enjoy! I love sweet potatoes and this is a unique use for them. What a lovely inspiration! I’ve never seen anything quite like it! I love coconut milk. I never heard of this dessert but sounds really good. My kids love sago so I tried to include sago in every dessert. The things is when I soak them in water or cold water (tried both) for few minutes, they fall apart. What happened? Hi and thanks for visiting. 🙂 I am not exactly sure what you mean by falling apart. I do noticed that tapioca pearls do not hold their shape as well. Sago pearls are made from a starch extracted from the sago palm while tapioca pearls are made from tapioca starch. Small tapioca pearls tend to “melt” away after being boiled. Hi Tia! So nice of you to visit. 🙂 This is a really nice dessert and I hope you get to taste it soon. Filipinos have a similar sweet/dessert dish as your Bubur Cha Cha. We call it bilo-bilo. In addition to the items you have in your recipe is langka (jackfruit), ube (purple yam), and the bilo-bilo which is rice flour and water, rolled into small balls. I’ve never made it because my older sister usually makes it. But now that you’ve provided the correct proportion of ingredients, I think I’ll try it.